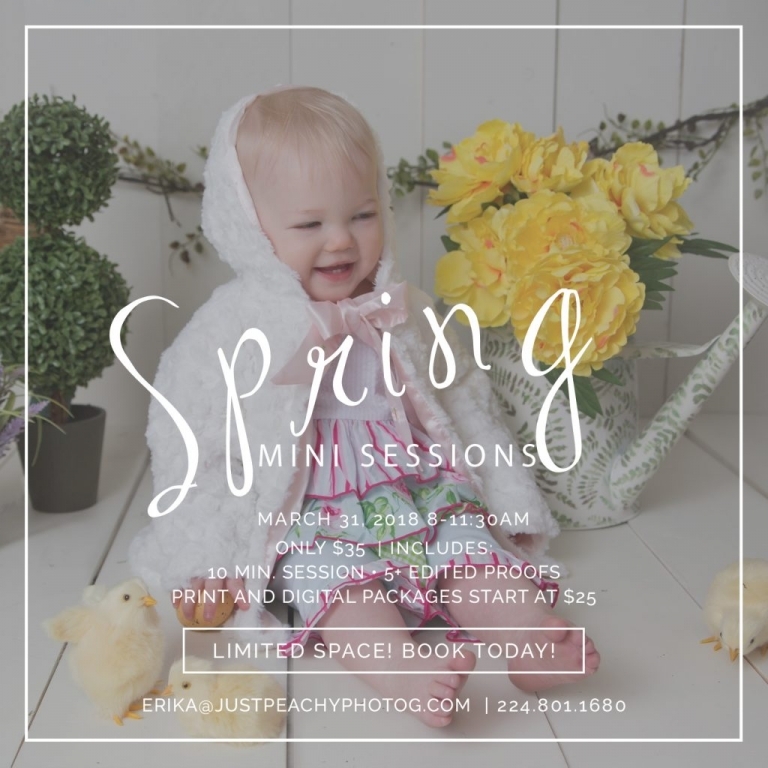 Spring Mini Sessions are coming soon! They will be scheduled on Saturday, March 31st from 8-11:30AM and will be 10 minute sessions. The Spring mini sessions are for ages 2 months through 10 years old and are offered for children only. Each session time includes up to 3 children. There will be an additional $15 fee for each additional child. Please note that the children MUST be in your immediate family and not extended family (no cousins or friends for this event–siblings only). The spring backdrop will be lighter colors, with green and floral accents. It will be perfect for boys and girls! The Spring Mini Sessions are $35 and include a 10 minute session with the special spring set up only. Digital files and print packages will start at $25. Please contact the studio for a full pricing list for this special event. You do not have to choose your package until after you receive your proofs but please note the minimum amount you will spend for this event is $25 (after your session fee is paid). In order to book your session, you must sign a portrait agreement and provide a $35 payment. Your space is not officially booked until these 2 items have been received by Just Peachy Photography (you will have 48 hours to return payment and portrait agreement due to limited availability). Proofs will be sent to all participants within 3-4 days of the event so that you can receive your images in a timely manner. If you cannot make one of the times above, I also have a few times before 8 or after 11:30am so let me know! Spring mini sessions scheduled on any other date are considered private and are at our normal petite session pricing. They can be combined with another backdrop though.